Get Bonus BoxTops at Sam's Club! Big BoxTops Promo at SAMS Club! Download the App and buy 3 BoxTops products for Bonus rewards! McClellan parents, it's time to dust off those BoxTops and send them to the school! This year we will be accepting BoxTops in baggies, clearly marked with your child's name and teacher's name. Each class will be competing in a monthly contest with a chance to earn prizes and the possession of the BoxTops trophy. We'll also be posting a chart at the school to keep track of classroom and school-wide accomplishments. We are very excited for this contest, and of course, earning FREE money for McClellan! 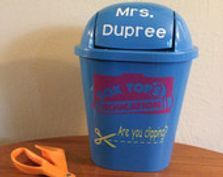 So, tell your child to be on the lookout for the BoxTop collection bin coming to their classroom soon. Monthly submission deadline: the last day of the month starting in November. For more information about BoxTops for Education, including eligible products, bonus Boxtops, and the Boxtop app, visit them online.